I had the pleasure of meeting with Julie and Bree in Willow Bend Mall in Plano last week. It's worth pointing out that Julie and I both found the experience so strange we are both blogging about it. Why oh why is there a playground where the kids are playing on steaks and eggs and french toast? It's a question we both asked ourselves. On my drive home I wondered what kind of playgrounds I might see kids playing on in Turkey. Or our friends to the South. Now can we all agree that kids climbing on a steak is odd? 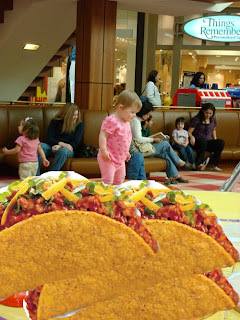 And yes, I promise I asked Bree's mom before putting her on tacos and then putting her on my blog. Bree's mom's got a great sense of humor. 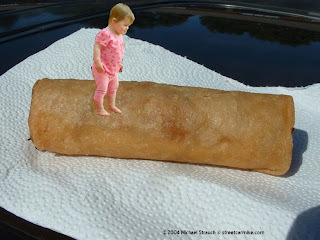 I hope someday she'll photoshop my child onto regional cuisine playgrounds. What a fun post. Bree looks like she would enjoy any food she got to climb on. Her curious look makes me wonder who thought climbing on food was stranger, her or you and Julie.